Carmella Barbera’s name first appears in the Painesville, Ohio, area in 1915. Carmella lived in Painesville until her death in 1954. In America, Carmella Barbera was known by her married name, Carmella Seggio. Carmella Barbera, daughter of Salvatore Barbera and Maria Seggio, was born on April 11, 1875, at Palermo, Sicily. She married Salvatore Seggio, son of Salvatore Seggio and Rosa Ciolta, about 1894 at Italy. 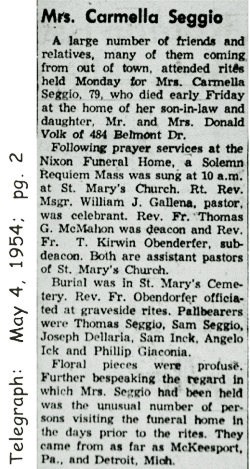 Carmella died on April 30, 1954, at her daughter’s home, 484 Belmont Drive, Painesville, Lake County, Ohio, at age 79. Her body was interred at St. Mary Cemetery at Painesville Township, Lake County, Ohio. Carmella Barbera, age 38, immigrated to the United States on November 17, 1913, travelling to McKeesport, Pennsylvania, joining her husband, Salvatore Seggio. Carmella immigrated with her children (ages 11, 9, and 6). Carmella Barbera established residence in Painesville, Ohio in 1914. Two of Carmella’s sisters were already living in Painesville. Rosa (Profeta) moved to Painesville in 1909. Concetta (Inchiostro) in 1913. A third sister, Giovanna (Dellaria) came to Painesville in 1921. 1. Salvatore Seggio was born on August 31, 1895, at Palermo, Sicily. He married Maria Inchiostro, daughter of Gaetano Inchiostro and Concetta Barbera. Salvatore died in September, 1975, at age 80. 2. Luigi Seggio was born on June 7, 1902, at Palermo, Sicily. He married Mary Gianforcaro, daughter of Giuseppe Gianforcaro and Carmella Letizia, in 1937. Luigi died on November 17, 1989, at his home, Painesville, Lake County, Ohio, at age 87. His body was interred at Riverside Cemetery at Painesville, Lake County, Ohio. 3. Giuseppe Seggio was born on May 21, 1904, at Palermo, Sicily. Giuseppe died on June 22, 1994, at age 90. 4. Rosina Seggio was born on February 5, 1907, at Palermo, Sicily. She married Giuseppe Giaconia, son of Filippo Giaconia and Maria Catalana, in 1925. Rosina died on September 8, 1988, at her home, Concord Township, Lake County, Ohio, at age 81. Her body was interred at Riverside Cemetery at Painesville, Lake County, Ohio. 5. John Seggio was born on April 17, 1915, at Painesville, Lake County, Ohio. He married Mamie Trentanelli. John died on September 17, 2007, at California at age 92. His body was interred at All Souls Cemetery at Chardon Township, Geauga County, Ohio. 6. 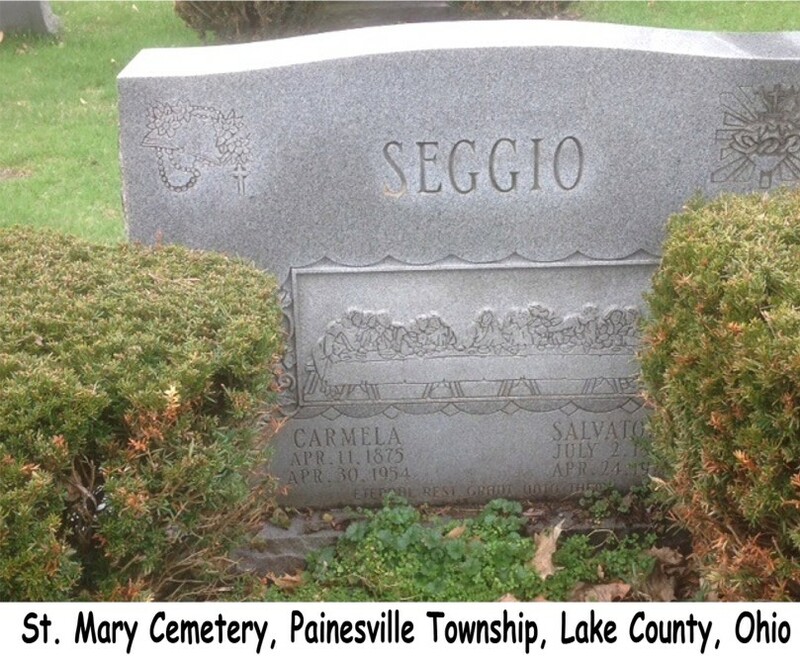 Mary Seggio was born about 1918, at Ohio. She married Donald Volk.